10-Jul-2001 -- After doing two other confluences today - 52°N 105°W and 52°N 106°W - we passed through the city of Saskatoon on our way to the third. The photo taken in Saskatoon shows one of several bridges that cross the South Saskatchewan River. City buildings and the castle-like Bessborough Hotel are in the background. After doing a few errands in Saskatoon we headed off at 4:00 PM. The third confluence of the day is near the town of Vanscoy, about 20 km southwest of Saskatoon on Highway 7. At Vanscoy we took a photo of "Prairie Pulse", a large seed processing facility situated along the railroad track. 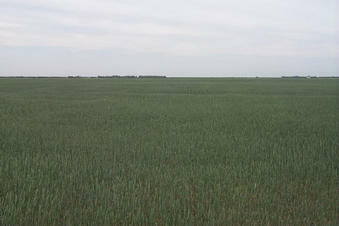 As wheat prices have plummeted in recent years pulse crops are becoming popular in Saskatchewan. Peas, lentils, chickpeas, faba beans, dry beans, and lupins are some of the pulse crops grown here. The seed processing facility in Vanscoy accepts chickpeas, lentils, large yellow peas and seed peas. They clean the seed, process the seed into bags or bulk ship. A short 1.3 km drive on a grid road heading west from Vanscoy led us to the spot. From our van we once again moved carefully along the furrows of a grain crop for 192 meters to the confluence, leaving our Wheaten Terrier, Max to guard the van. The "east" view from the confluence shows the town of Vanscoy. The "west" view shows trees to the left that surround the farm house shown in our photos and on the right, part of a potash mine is visible. To find out more about potash mines see the first paragraph of 52°N 106°W. Near the confluence a natural gas pipeline passes underground. It is marked with the yellow "37" and "danger" sign shown in the photo. Back on the outskirts of Vanscoy we took a photo of ourselves sitting in the bleachers of the empty rodeo grounds. Near us, on the fence surrounding the outdoor rodeo arena, a sign says, "YOU ARE HERE AT YOUR OWN RISK". Thankfully we came to no harm while sitting there! Without the adventure of climbing mountain tops, crossing deserts, hacking through jungles or wading through swamps in Saskatchewan, we went for the challenge of "quantity". After three confluences in one day we were satisfied with a job well done. At the junction of Highways 7 and 45 is the town of Delilse. At 6:40 PM a cafe at that junction provided us with a good supper before the journey home. We took a route south through Outlook then across Highway 15 to join Highway 11, the main route between Saskatoon and Regina. Near Davidson the clouds were building up and a light rain began to fall. As the sun began to set, we witnessed a beautiful double rainbow stretching from horizon to horizon. The sun set at 9:17 PM providing us with a beautiful prairie sunset. We arrived home at 10:32 PM after a total trip of 703 km and another successful day of confluence hunting. #2: Looking east. The town of Vanscoy can be seen in the distance. #4: Looking west. Behind the trees a farm. Beyond that a pile of potash. #5: Carolyn, Alan and Max on the bleachers on the Vanscoy rodeo grounds. #6: On our way we passed through Saskatoon, the city of bridges. #7: "Prairie Pulse" seed processing facility at Vanscoy. #8: The farm that is situated behind the trees to the west of the confluence (see "Looking west"). #9: Marker for the natural gas pipeline passing through the field where the confluence lies. #10: GPS reading at "the spot".